Through fall and winter we had our hearts set on calming mint green. Don’t get me wrong, it’s a tried and true color, but with spring in the air I’m finding myself skipping down a yellow brick road. 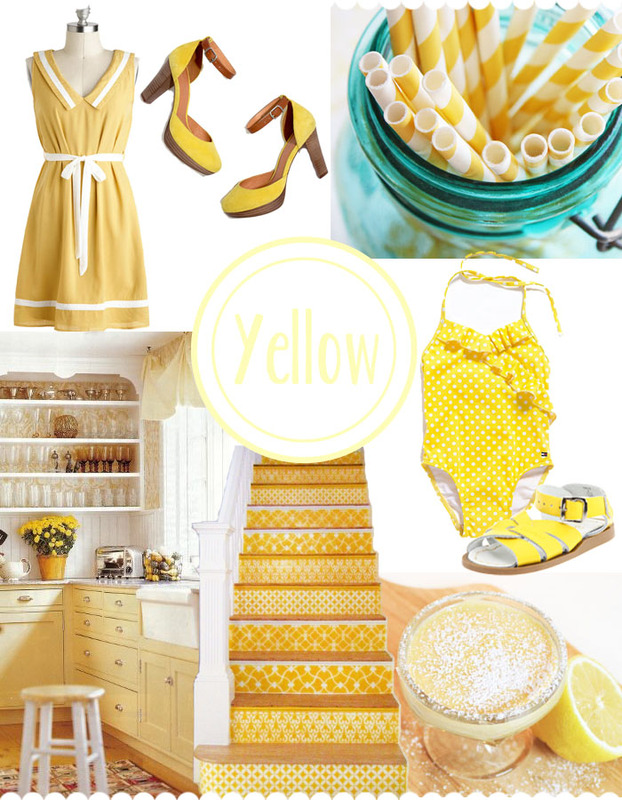 I imagine throwing a spring fling with everyone gathered in my yellow kitchen sipping on lemonade through yellow striped straws in blue mason jars. All the baby girls would be dressed in yellow polka-dot bathing suits with canary yellow sandals – and these swim trunks for the boys. For me, I’d head up my DIY stenciled yellow staircase to my lemon burst bedroom to pick out a nautical yellow dress or a pair of fantastic yellow heels. We’d all sit back and relax in the warm sun and devour Jaime’s single-serve lemon bars and Jacinda’s heart-shaped salad. Oh yes, this sounds like the perfect spring day. How will you bring the color of happiness into your world this spring? Gorgeous collage, it’s totally brought some sunshine to my day, thank you! I’m now going to sift through my things and find some yellow to bring out tomorrow, inspired by you. Awesome ideas for the color yellow. I shared this with my facebook friends. Thanks.